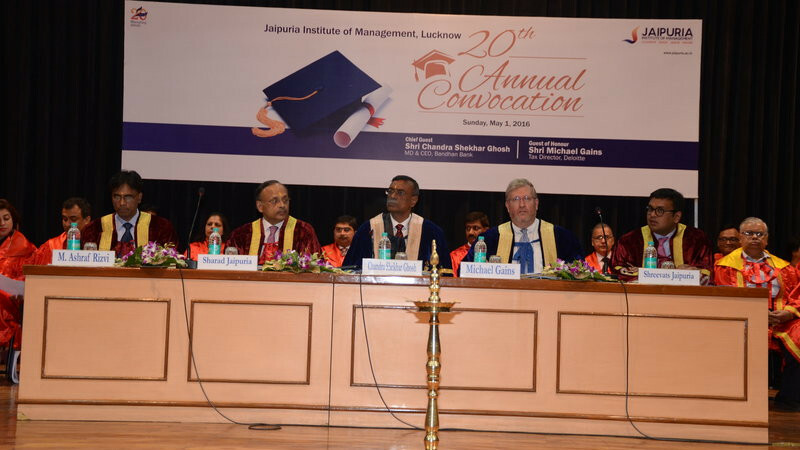 The graduating ceremony for Batch 2014-16 of Jaipuria Institute of Management, Lucknow was held on the 1st of May, 2016. The Twentieth Annual Convocation saw a total of 282 students graduate from the PGDM, PGDM (FS), PGDM (RM) and PGDM (Part-Time) programmes. The Chairman, Shri Sharad Jaipuria, Vice Chairman, Shri Shreevats Jaipuria, Director of the Institute, Prof. Ashraf M. Rizvi, the esteemed members of the Board of Governors and the Academic Council of Jaipuria Institute of Management, Lucknow, were present to acknowledge the success and achievements of the Batch 2014-16. The Chief Guest for the occasion was Shri Chandra Shekhar Ghosh, MD and CEO of Bandhan Bank, and the Guest of Honor was Mr. Michael Gains, Tax Director, Deloitte. Shri Sharad Jaipuria welcomed the Chief Guest, other dignitaries, officials, students and guests. While delivering his welcome address, he extended his best wishes to the students and shared valuable advice for the future: “Industry is at the threshold of taking a quantum leap and as beginners we need to adjust to the exponential changes that are happening every moment. Therefore, as students move from the academic corridor to industry, it is very important to be a lifelong learner. We need to remember the saying that when it comes to knowledge, always be hungry and be foolish”. Prof. Ashraf M. Rizvi, Director, Jaipuria Institute of Management, Lucknow, highlighted the milestones achieved by the Institute during the academic year 2015-2016. Emphasizing the achievements during the year he said “We were among the top 50 business schools in India and we worked really hard for this honour. 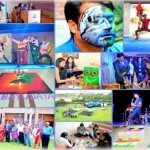 Jaipuria, Lucknow held various conclaves, seminars, conferences and faculty development programs. In totality, 75 such events were conducted. Eminent guests from all spheres of industry, including CEOs and Directors, were invited. 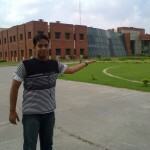 In terms of placements, close to 225 companies visited the campus. In addition, there was an experiment of entrepreneurship through incubation. Furthermore, changes were made in the curriculum design.” He concluded by addressing the graduating students, advising them to stay focused, work hard and maintain good relationships. The Chief Guest, Shri Chandra Shekhar Ghosh, in his address, congratulated all of the students. He gave glimpses of his own life’s history: “Entrepreneurship is the key to employment generation. Knowledge is transformed into skill gradually, and to expedite it, various internships should be chosen. In order to meet the challenges of life, we should have the right attitude. So, students should always hit on their KSA, i.e. Knowledge, Skill and Attitude.” Mr. Ghosh innovatively defined Ph.D as Passion, Hard work and Dedication. He advised students to “want what they get” rather than “getting what they want”. He conveyed his best wishes to the graduating students and encouraged them to lead lives with humility. The Guest of Honor, Mr. Michael Gains, explained that patience is indeed a virtue saying,“I cannot give the formula for success but surely of failure, which is trying to please everyone. Nothing is ever accomplished on the first day. Students should have patience till they get what they want. Therefore, working hard should not be a problem.” Addressing the students, he asked them to be the person people want to emulate and pressedthem to keep imagining and thinking big. The Vote of Thanks was proposed by Shri Shreevats Jaipuria, Vice Chairman, Jaipuria Institute of Management, wherein he said “I am proud that students are raising the standards of the Institute. I thank all the guests for sparing their valuable time on this Sunday afternoon.” He also congratulated the young ladies and gentlemen and advised them to synergize their strengths as they prepare for their future careers. In totality, 282 students successfully completed various programmes from the Institute this year. The programmes are: 2-year full-time PGDM, 2-year full-time PGDM (Financial Services), 2-year full-time PGDM (Retail Management) and 3-year part-time PGDM programme. The diplomas were conferred on successful candidates by Shri Sharad Jaipuria. Meritorious students were awarded scholastic medals for their outstanding performance by the Chief Guest and Guest of Honor. In addition to various scholastic medals, a trophy to recognize the ‘Student of the Year 2016’ for exceptional scholastic performance across all of the two-year full-time Post Graduate Diploma in Management programmes of the Institutewas presented to Ms. Nikita Srivastava. Sagarika Bharadwaj was awarded the Chairman’s Gold Medal; Sakshi Agarwal was awarded the Vice Chairperson’s Silver Medal and Shikha Gupta was awarded the Director’s Bronze Medal in the Full-time PGDM Programme. Pooja Vishwakarma was awarded the Chairman’s Gold Medal in the Full-time PGDM (Retail Management) Programme. 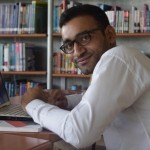 Rishad Murtaza was awarded the Chairman’s Gold Medal in the Part-time PGDM Programme. Nikita Srivastava was awarded the Chairman’s Gold Medal in the Full-time PGDM (Financial Services) Programme. Certificates of Merit across all of the Full-Time PGDM programmes in the areas of Marketing, Finance, Human Resources, Information Systems, Operations and Retail Management were conferred on Shikha Gupta (Marketing), Shivangi Srivastava (Marketing), Pooja Vishwakarma (Marketing), Nikita Srivastava (Marketing), Sagarika Bharadwaj (Finance), Nikita Srivastava (Human Resources), Sagarika Bharadwaj (Operations), RohitKewlani (Information Systems), and Pooja Vishwakarma (Retail Management) respectively. The Distinguished Alumnus Award was conferred on three Alumni: Mr. PushmitraJetly, MD, PR Foods, was presented with the Entrepreneurship Award. Mr. Ankur Bahorey, Group Head – Retail Business, HDFC ERGO General Insurance Co. Ltd. was awarded for Corporate Excellence. In addition to this, Mr. Parag Tandon, President & CXO, Aura Inc., was awarded for Notable Public Service. Dr. Raj Kumar Ojha was awarded the Distinguished Faculty Award.